Sharara sharara! If you’re the kind of to-be- bride who does not want to wear the usual anarkalis, lehengas, and sarees but wants to experiment with her wedding look then a gorgeously embroidered sharara is just the perfect choice for you. 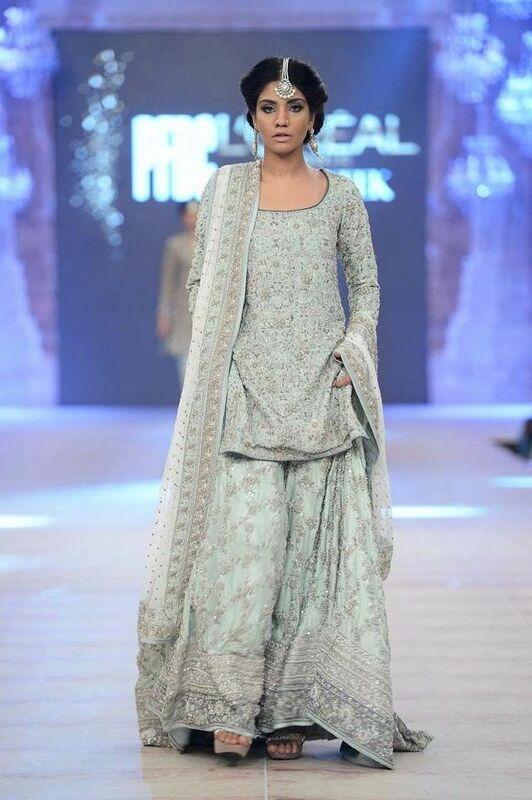 A sharara is a pair of loose pleated trousers worn by women from South Asia, typically with a kameez and dupatta. It has the form of a lehenga but the functionality of pants and can be worn with multiple things. Choosing the right sharara for you can be difficult bearing in mind the varieties it comes in. 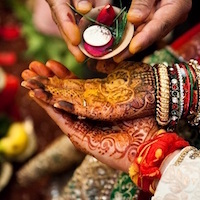 So here we are with some of the most beautiful shararas for your wedding. Oh, this gorgeous, gorgeous color! This subtle blush pink is for the people who don’t like things loud and pompous. With silver or gold detailing and maybe trying an off-shoulder cut, this sharara will definitely turn heads. 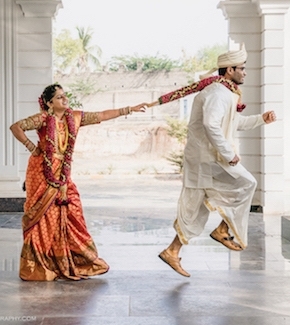 While some brides try to keep it subtle, most decide to go all out on their wedding day. One of the most beautiful shararas you can wear is this heavily embellished one. This is for the brides who want to look nothing but royal queens on their wedding day. 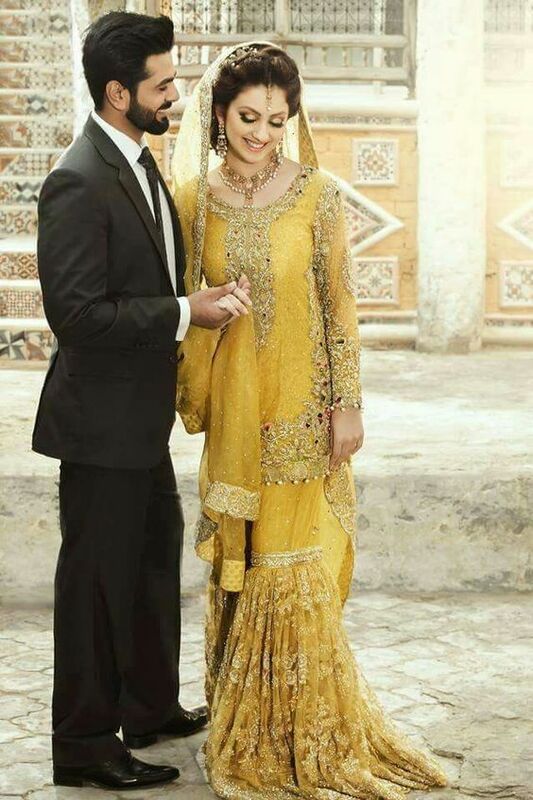 Add that burst of color with a yellow sharara for your special day. Yellow, the color of happiness and energy is different than the usual colors worn for a marriage and also represents optimism and warmth. One of the most beautiful shararas you can don on this auspicious day can be one in the shades of pearl white, primrose or mint green. Pair this outfit with gorgeous pearl or silver jewellery to complete the stunning bridal look. The color blue is eternal and blends into every style and combines beautifully especially with golden or silver detail patchwork. The shararas shown below are two different shades of blue, one of the dark tint and one of the lighter tint. The beauty of blue lies in its vibrancy for sure. 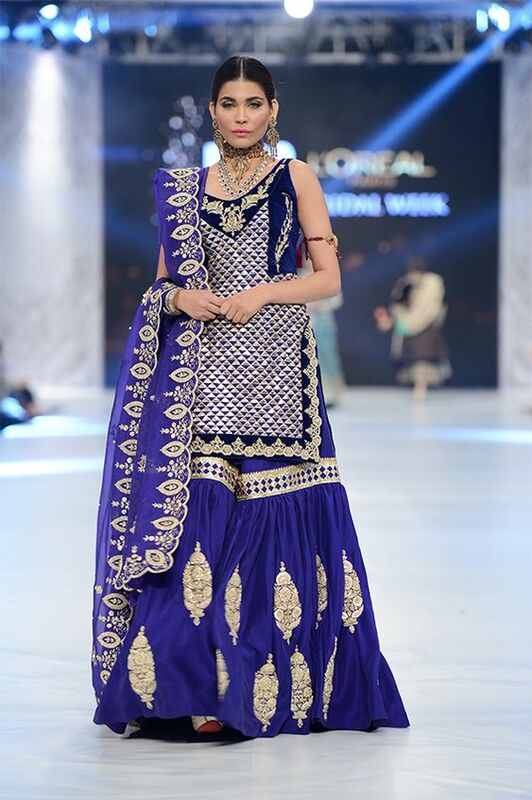 Adding to our list of gorgeous handpicked runway designs, this black and golden sharara scream grandeur. The balanced ornamentation of the kurti and dupatta is chic. Complete this look with some gold jewellery and a classy attitude. Emerald or shades of emerald are trending this season. 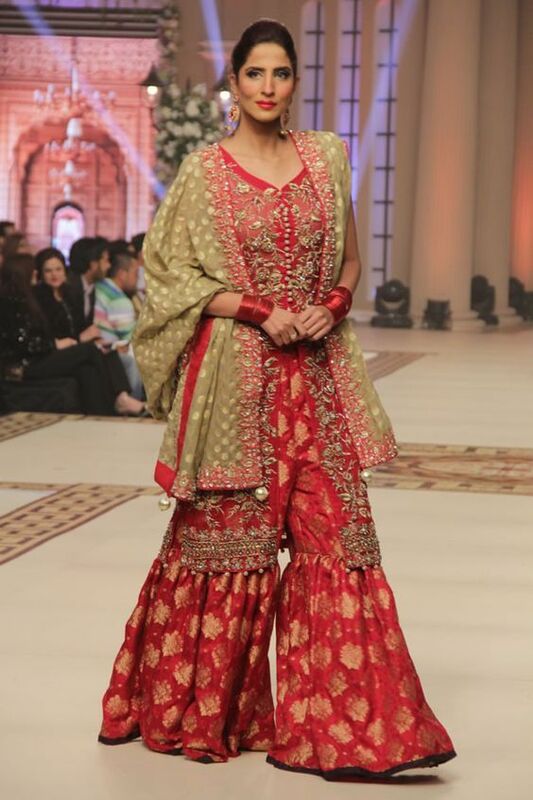 This sharara is attractive in its own glory. The intricate stonework in the bottom makes the difference here making the dress look rich and classy. Red, the color of traditions. One can never stop experimenting with red nor can one go wrong with it. This sharara stands out a bit because of it exquisite color and the jacket-kurti. 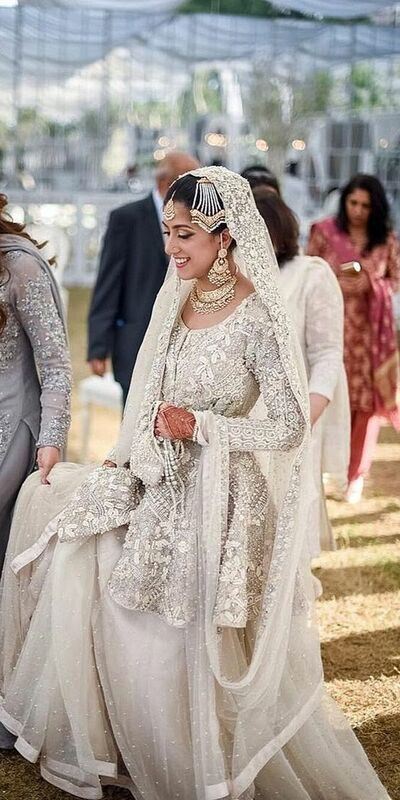 The appealing golden dupatta adds to this charming bridal outfit. And last but not the least, one of the most beautiful shararas you can wear is this one. 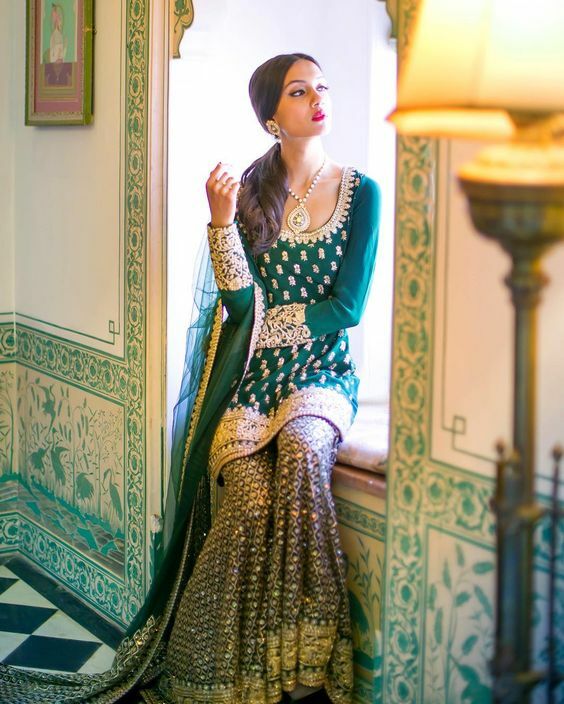 The muted color and intricate work will make it hard for your guests to keep their eyes off you even for a second. 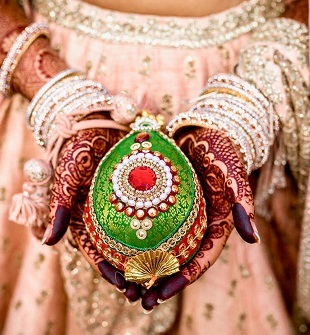 What we love about this look is definitely the subtle color and gorgeously adorned jewellery which brings the touch of royalty. So here are some of the most beautiful shararas we found that would be perfect for you to look like an absolute queen on your wedding day. Comment down below and let us know which one was your favorite look!